Over the last 15 years my system has been on an ever-upward trajectory of both performance and unfortunately, price. Needless to say, $50k here, $50k, and we’re talking real money. Along with these expenditures has come a pretty refined level of performance, to the point where I have lost the upgrade bug and have spent the last several months just kicking back and discovering new music through my Krell Connect streamer, enjoying my old familiar chestnuts. Yes, I have been pretty content, and you know what that means- a perfect time to turn the whole equation on its head! What if I downshifted and tried a component at a much lower price point? And what if that component was the speaker? With this perilous endeavor stuck in my craw, I began to scour the internet for reviews and commentaries on as many reasonably priced speakers that would fill the bill. $10K, $8K? Still too high. I needed to go really low while avoiding the sonic bends. In the end, after reading several flat out raves, I settled on pursuing the Golden Ear Triton One speaker from the soul of Sandy Gross, founder of Polk Audio and Definitive Technologies. How about those for credentials? The Golden Ear Triton Ones cost $5K- Yes, that’s for the pair! There are five models in the Triton lineup to fit any budget. Along with Sandy, we moved the refrigerator sized cartons into my loft and then scampered off to dinner. Just based on the size-to-price ratio, you can do no better! Perhaps I forgot to mention that I put on as brave a face as possible enjoying our conversation while inhaling my parpadella with lamb shank reduction. Deep down, I was dying to get home and tear open the cartons and get on with the long planned experiment. Since the cartons open from the long side, I had both speakers wriggled out of the boxes, set up and playing within 10 minutes. No, the Triton One is not clad in my favorite exotic endangered woods from some far off rainforest. A simple yet reasonable fabric sock snuggles the contours and fits without a bump or seam showing anywhere. They cut a very slim elegant profile and passed my wife’s critical eye for anything taking up space in our very dear Manhattan real estate. A little Technology. According to Sandy: “The construction is very solid and inspires confidence. The cabinet is constructed from high-density medite. The side cabinet walls are non-parallel which has benefits both acoustically and visually. This spreads out the peaks due to internal standing waves as well as results in a stiffer cabinet structure. There is considerable internal bracing. The grill sock construction is utilized for both industrial design as well as acoustical reasons. It provides additional sheer dampening to the cabinet walls. Most importantly, for imaging reasons, is the narrow front baffle. It has long been observed that small mini-monitor type loudspeakers have outstanding imaging. Much of this has to do with the narrow front baffle and the resulting benefits relative to diffraction effects. 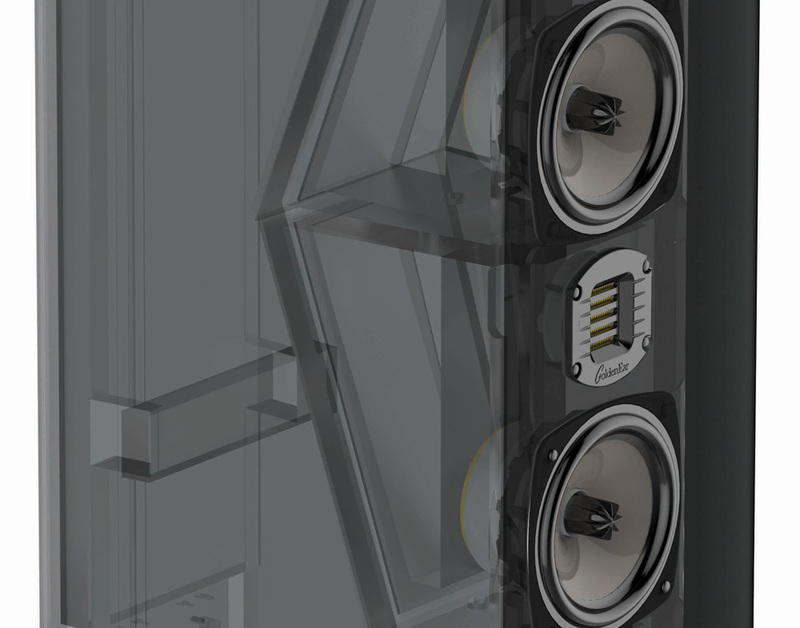 “In the bass range, the entire speaker and the cabinet, in particular, is designed to optimally couple with the room and deliver exceptional low frequency performance. We have sometimes noted a disparity in bass response test measurements and the bass performance that a listener actually hears and experiences in a room. This sort of anomaly is due to the inexact science of how to do bass measurements, that are usually anechoic or quasi-anechoic in nature (for consistencies sake, which is certainly understandable), which properly correlate with in-room response, which is the result of many variables. In the case of the Triton One, we have three active bass drivers. In addition, we have four low-frequency sub-bass radiators, which are located on either side of the cabinet, very close to the floor. This takes full advantage of the floor coupling as well as that by having the radiators in four different room positions, helps to break up standing waves, due to the rooms’ eigenmodes. In addition, the four bass radiators take advantage of the phenomenon of acoustic coupling, which provides additional gain and bass radiation into the room beyond just the simple additive sum of their outputs. In this case 1+1 doesn’t equal 2, but rather 3 or 4. “Also, of course, since a Triton system would put two subwoofers in a room, you also get bass output that is not only the additive result of the two sub-woofers, but also delivers additional gain due to the acoustic coupling of the two subwoofers plus the additional advantage of the two subs smoother interaction with the room because they are coupled to different room modes. As this particular pair has been touring reviewers and trade shows, there was no need for break in. From the first note of Billy Cobham Best Hits, Red and Yellow Cabriolet , I was, I was, um, what was I? Gobsmacked? Shocked into drooling and mumbling to myself? The thought of being the one reviewer to find the Golden Ear Triton One somehow lacking vaporized amongst the liquid, pulse pounding chaos of the track. Could it be this good? The imaging, the texture, the dynamics both large scale and small offered by the Triton One, were projected with an enthusiasm and life that was totally engrossing. The D’Agostino Momentum integrated amplifier really had the attention of the Triton One. The absolute control exhibited by the Momentum allowed the Triton One to perform at an exalted level. How far out from the front wall was optimal for the Triton? This is another point where similar reviews fall far short. 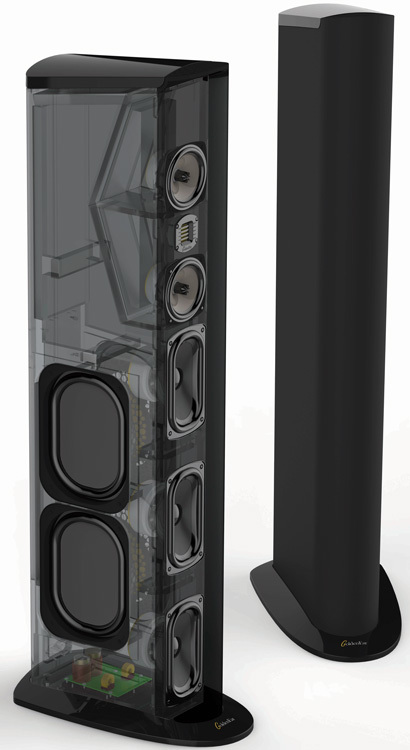 As stated in the review, “My large listening space…,” means nothing to those who have not obsvered the location or are otherwise aware of the dimensions. Listening space constitutes a huge impact on the reproduction of sound from loudspeakers. Duh. Same speakers sounding great in a high ceiling room with carpeted floors sounds like wtf? in a living room with wood floors and typical 8′ ceiling. Aside from my comments above, I’d love to audition the Triton 1’s, 5’s & 7’s. The nearest dealer to me is a 2 hour drive, but that retailer is not your typical audio/video store. They were not open when I drove by last Saturday (while I was in the area visiting family) and there was no return call in response to the message I left. Perhaps the difficulty in actually securing an audition/purchase is a marketing ploy. Hi, Sorry that your nearest dealer was closed. Please email me at sandy@goldenear.com with the name of the dealer and I will look into this and try to arrange a special audition for you. Also, if you know of another appropriate specialty dealer closer to you, please advise me and please, let them know that you are interested in GoldenEar. Please understand that the fact that we don’t have a dealer everywhere is not a marketing ploy. We have over 200 dealers in the US, which is a lot for a specialty manufacturer, but the US is a big place. Whether a dealer handles our loudspeakers is their decision. We can’t force our speakers into dealers who don’t want to handle them. We would like to have a good dealer, within a reasonable distance from all interested parties, like yourself, but this is a long process. And dealers have their own schedules, so it is always best to call to schedule an audition, and to check on what speakers they have on demo. As I said, I will contact this dealer and arrange something for you. Regarding speaker placement: We try to engineer our speakers so they will sound good in a variety of rooms, but certainly, the room always has an effect. One point, though, since the Tritons with the built in powered subwoofers have a level control on the powered bass section, they are much more flexible regarding different rooms and proximity to walls than is usual. And, if one speaker is close to a side wall, and the other out in the open, you can also easily compensate for this.